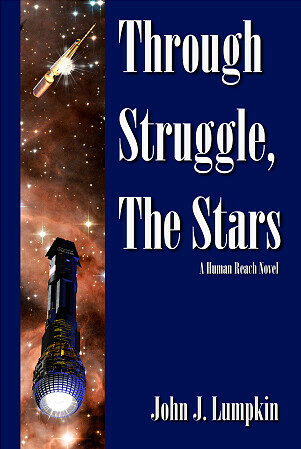 I was pleasantly surprised by John J. Lumpkin's first novel, Through Struggle, The Stars. I'm normally wary of the sub-genre of military science fiction. Many of the more recent titles that I've seen appear on bookshelves aren't very good books at all, titles written by their generally right-wing American authors who were much less interested in the art of writing than they were in creating crude nationalist propaganda. The need for a jihad against Muslims, the amusing fatal decadence inherent in the French (or, more broadly, Europeans), the underhanded cunning of the Chinese, the need for the simpler and more martial mores of the past to replace an immoral liberalism--all these tacks have featured too prominently in too many milSF books I've picked up for me to feel comfortable with the genre. To the author's credit, he did a very good job of avoiding this pitfall of milSF. Through Struggle, The Stars is set in the starfaring future of 2139, decades after the development and deployment of technologies capable of creating stable wormholes between points in space light-years apart and antimatter-fueled starships capable of transporting wormhole terminuses to distant planetary systems made interstellar travel possible, and after a devastating asteroid impact on Earth gave every countrry capable of mounting interstellar colonization efforts the incentive to do so. Colonies from dozens of different powers are scattered among the nearby stars, different countries' colonies clustering in different areas. China and Japan, apparently the dominant powers on Earth, are also prominent players beyond the Solar System. Of late, these countries have begun to drift towards war. In this dynamic, unsteady environment, newly commissioned American cadet Neil Mercer joins the United States Space Force and catches himself up in the various maneuverings of the United States as it and its leadership bring the United States and its allies into the Sino-Japanese conflict. To my relief, no one is propagandizing for any country in this novel. Each of the actual and potential combatants have their good sides, but each also has their own flaws. Lumpkin has written a novel where China is probably the biggest power in the world, but it isn't an obviously evil or threatening polity. Military fiction novels where the parties in a conflict are complex are inherently more interesting than ones where contrived conflict is created between Good Guys and the Evil Ones, if only because it makes it possible to sympathize with characters on all side that aren't sockpuppets. Lumpkin deserves to be praised for his even-handedness. Some of my fellow reviewers have pointed out that the world of 2139 is a world where not much seems to have changed since the early 21st century, politically and otherwise. China is an oligarchy with an expansive sphere of influence on Earth; Britain is an independent American ally outside of an integrated Europe where France seems to be a major player; countries in the global South like Brazil, India, and Mexico seem to be present only in passing, although Iran does make an interesting appearance. Culturally, too, the world of 2139 seems almost too recognizable and contemporary, a certain Hispanicization of the United States aside. These likely anachronisms did stand out to me, although they didn't prevent my enjoyment of the novel. The novel is definitely a good first novel, and a worthy one. I'd give it 3.5 stars out of 5. The novel's website points to it being the first novel in a projected series, The Human Reach. I look forward to seeing followups, and to seeing this and other novels on the series on bookshelves. Well done.